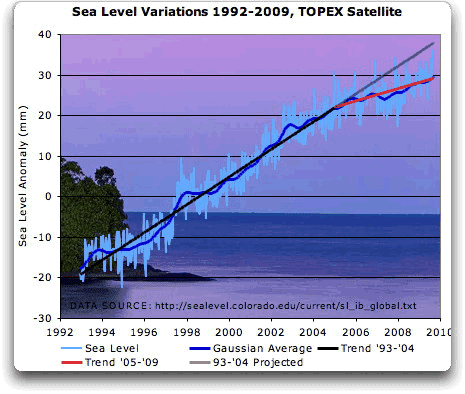 Topsy turvy - Wondering Willis Eschenbach tells big whoppers about sea level. Wondering Willis Eschenbach doesn't usually go in for straight fabrication of other people's work, but he made some exceptions today. Usually he'll just wonder and ponder and either invent stuff out of nothing or claim well-established science as his own, usually distorting it. Today he decided to go for straight misrepresentation (archived here). Or should I say crooked misrepresentation. Almost everything he wrote in his article is contradicted by the work of the scientists he claims to be writing about. Thank you for your prompt reply. I’m 62 and now semi-retired. I’d like to bring myself up to speed on global warming, which I read is one of the great catastrophes of our time. You describe rising sea levels as being the evidence for man caused global warming. It had been my understanding that sea levels have been rising steadily for thousands of years and now at a very slow rate. I know there’s been a huge increase in man’s CO2 in the heavy industrialisation since World War 2. 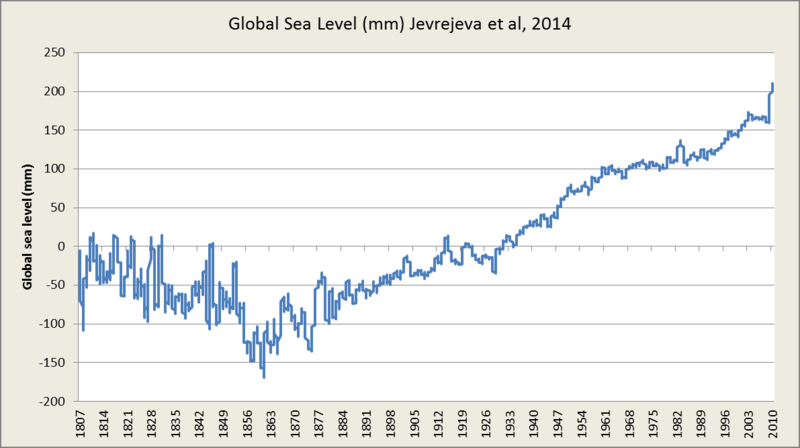 How has this increase in man’s CO2 effected sea levels ? The rates have not been steady and picked up markedly in the mid 20th century and even more since 1990 or so. CO2 has been increasing since 1750 although mainly since 1850. Given the tone of the email, it was good of Dr Trenberth to bother responding, don't you think? Willis made the original sender an "anonymous coward". All in a bad cause, I expect. Perhaps to shield them from questions like: why send an email to Kevin Trenberth asking him about sea level? Why not ask someone who does research on sea level. And why on earth would anyone go to Willis Eschenbach on sea level. Willis doesn't even understand what causes winter and summer. How could he hope to understand anything about sea level. Well, it turns out he doesn't understand anything about sea level. Let's see what he got wrong. ...Why is there such a jump in the C/W analysis? It’s because Church and White played fast and loose. They simply spliced the satellite-based sea level data onto the tidal stations data, ignoring the fact that the satellite rise is about 50% higher than the tidal station data. So they just hoisted up the tidal data by that amount, so it would kinda sorta match to the satellite data … and then smoothed the splice with a centered filter. Bad scientists … no cookies. I don't know what "jump" he is talking about. In any case, John Church and Neil White didn't "just hoist up" tidal data. Go on, read the paper for yourself. It describes the intricacies of working out global mean sea level for the period prior to satellite altimetry data. And it refers to the differences between global mean sea level and coastal sea level. Willis just doesn't have a clue. Not that I'm pretending any expertise but it's easy to see that Willis is wrong here and the scientists are right. That's not too different from the Church and White chart. The Jevrejeva chart also shows a jump in the rate mid-century. It then flattens out a bit before jumping again in more recent years. With the exception of the big dip in 2010-11, when the water shifted from the oceans to Australia and South America as we got inundated in floods. It soon flowed back into the oceans, as you can see. Anyway, Jevrejeva et al found that the rate of sea level rise has now jumped to over 3 mm/year from 1.8 mm / year average over the twentieth century. As you can see, the idea that the rate of sea level rise “picked up markedly in the mid 20th century” is totally contradicted by the Jevrejeva data. Yet you don't just have to see he's wrong from looking at the above charts. Jevrejeva14 itself has a comparison. If you look at the chart below that Jevrejeva14 themselves did, comparing their analysis with that of Church and White, you can see that the Jevrejeva actually found a bit steeper rise in the mid-twentieth century (blue) than did Church and White (red). Once again, that's the complete opposite of what Willis wrote. 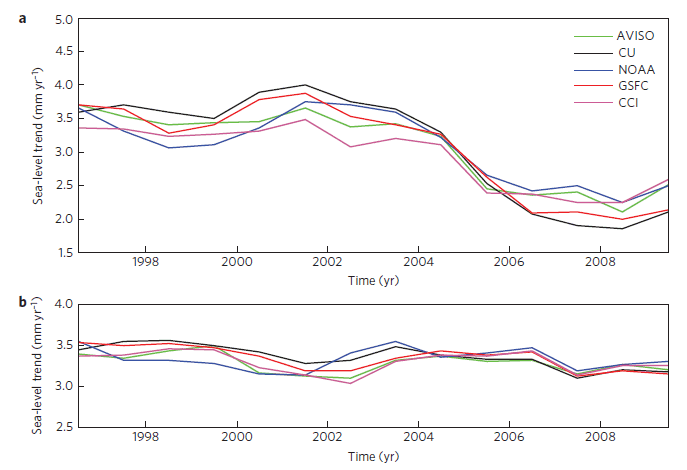 We find that when correcting for interannual variability, the past decade’s slowdown of the global mean sea level disappears, leading to a similar rate of sea-level rise (of 3.3 ± 0.4 mm yr−1) during the first and second decade of the altimetry era. Figure 2 | GMSL rate over five-year-long moving windows. a, Temporal evolution of the GMSL rate computed over five-year-long moving windows shifted by one year (start date: 1994). b, Temporal evolution of the corrected GMSL rate (nominal case) computed over five-year-long moving windows shifted by one year (start date: 1994). GMSL data from each of the five processing groups are shown. If you click on that chart to enlarge it, you can see how the rate of sea level rise from 2003 to 2011 was similar to that from 1994 to 2002, after correcting the GMSL for the mass and thermosteric interannual variability (b). I found this pdf of Cazenave14, and there is this article about it if you want to learn more. 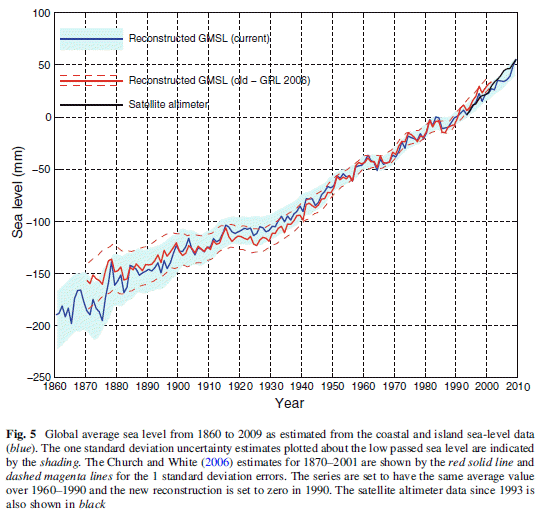 If you compare all the papers, they all find that the recent rate of sea level rise is above 3mm/year now. Which is higher than the average of the twentieth century, although there have been short periods in the twentieth century when seas probably rose as quickly. Almost everything that Willis wrote was back to front, the opposite, from what the scientists themselves wrote. Why is Willis making up this stuff? Why was he being so deceitful? I mean he even provided links to the papers that he misrepresented. Perhaps it's because he knows that he can say anything at WUWT because Anthony Watts can't tell if it would "stand the harsh light of public exposure". I might as well put up Willis' chart of sea level, together with the chart from U Colorado showing the Global Mean Sea Level Time Series (seasonal signals removed). Dr. Trenberth is busy. He has a career. And a life. In fact it’s pretty impressive that he gave a few minutes of his time to this. The highest rate of change in the Church and White graph is around 1990. The second or maybe third highest point is around the mid-century. 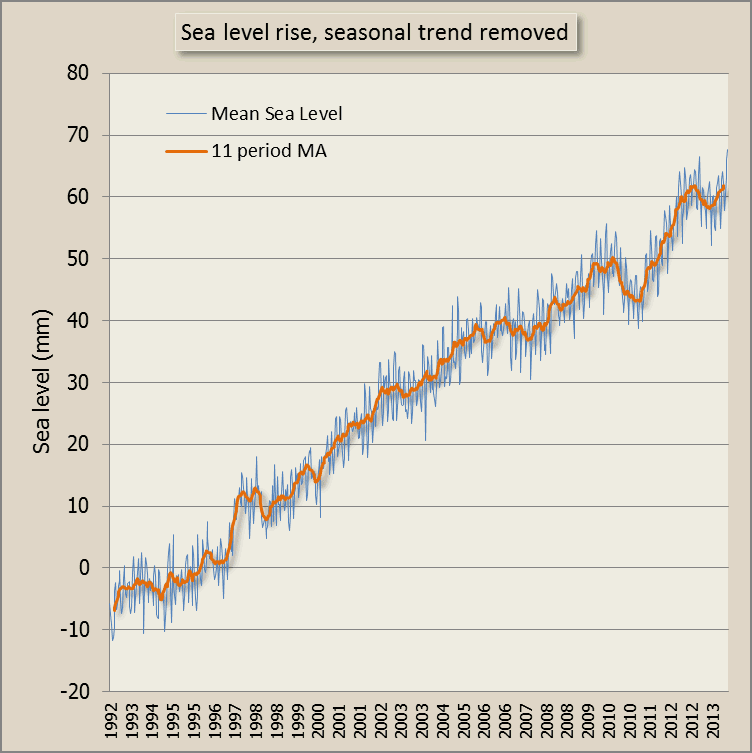 Still sea levels continue to rise. Where’s all that global cooling you keep on telling us about? Stop nit-picking and get a life. Geez, Husky, when one is looking for long term trends, you don’t focus on the short term variations, you average them out. There are peaks and there are minima, but the overall trend is gradual and counter balanced by the satellite measurements. That's about it for now. So far there are only eight comments. I expect that even the WUWT-ers are scratching their heads wondering what has got into Wondering Willis. "....he chops it off at 2009 for some weird reason:"
post-2009, his little cherry doesn't 'work', not that five years ever meant anything...really Willis is a time-waster. Such a fool. His risible 'attack' on Church and White is really offensive, and doubly so for his frequent hand-wringing about scientific standards. WUWT, still offering the most wretched and deluded contrarianism. I can't say that I've ever seen Willis make up such obvious lies before. I mean he gets things woefully wrong all the time, but he doesn't usually tell such blatant fibs about stuff. Or not that I've noticed. This time he misconstrued everything he wrote about, from the beginning to the end of his article. And that chart of his - that was brazen fabrication. It wouldn't make sense, but the thought crossed my mind that he was just wanting to see how much deliberate mischief he could get away with at WUWT. To see if the readers there are really as dumb and credulous as they make out. And they are. I'm probably giving him too much credit for brainpower. He's probably not that smart. In the same couple of days he's made an absolute fool of himself with the perihelion / aphelion nonsense, and now this. He likes to make out he's the smartest chap at WUWT (and maybe he is, which is a savage indictment on the rest of them). The TOPIX satellite mission ended in 2005, but Willis has it's data going to 2009.????? Also the file that he claims is the source no longer exists. The closest file from the website doesn't even look like his, and the graph from it is VERY different. Of course, a denier won't bother to do these sorts of checks. The Cazenave paper has been doing the rounds of the denier blogs, misrepresented of course. And trying to explain that short term trends during a La Nina will be lower than the long term trends is like trying to explain quantum mechanics to a dog. The end result, is the babbling nonsense as demonstrated by Willis. It's true that 2004-2009 falls below the trend line, so he could have made the same point with the active *.txt file, but then serious skeptics might have put the reduced sea-level rise rate for 2004-2009 in context (http://sealevel.colorado.edu/). Perhaps because if you look at all the data the GMSL curve goes back to the trend line. The big dip towards the end (2011) is due to the big La Nina event. TOPEX/Poseidon was replaced by Jason-1 in 2002 and Jason-1 was replaced by Jason-2 in 2008. There is information about this in the 2011 Church and White paper that Sou links to. Welcome to HW, Neil. Thanks for dropping by. Live by short-term trends, die by short term trends. "Given the tone of the email, it was good of Dr Trenberth to bother responding, don't you think? Willis made the original sender an "anonymous coward". All in a bad cause, I expect. Perhaps to shield them from questions like: why send an email to Kevin Trenberth asking him about sea level? Why not ask someone who does research on sea level." It is great that people can mail a scientist and get an answer. However, I do think that people could do a little homework first. You can expect people at least to first read a book. If you then have a specific more difficult question, that is the time to write an email. Before you write a nonsense blog post completely misunderstanding a topic would also be a good moment to write an email. Sou, I guess these are the easy posts for you to write. If a mitigation skeptic talks about a scientific paper, all you need to do it read it and you have a good chance that the paper says something completely different. "I expect that even the WUWT-ers are scratching their heads wondering what has got into Wondering Willis." You are being too generous. It shows HadCRUT4 versus CO2 concentrations. It has been mangled in several ways that would need an essay to describe (up for it Sue?). But the most obviously misleading thing about it is the downward trend in the data between (what appears to be) January 2003 and Sept 2014. This is indicated at the bottom of the chart with a big bar saying 'Negative'. Not being a fake sceptic I checked this. In the latest HadCRUT4 version not only is there no downward trend between Jan 2003 and Sept 2014; in fact there is a slight warming trend (I make it 0.01C/dec): http://www.metoffice.gov.uk/hadobs/hadcrut4/data/current/download.html In any case, the trend certainly isn't downward. Has it reached the stage that 'sceptics' will put out any old nonsense, even to the extent of blatant fabrication, because they can be confident that none of their 'sceptical' audience is, in fact, the least bit sceptical? Seriously? You are de-bunking a skeptic claim of negative with 0.1 degC/century. Have they contacted you about your Nobel prize yet? Going by the comment from the anonymouse above, I'd say you've got your answer, DavidR. See my latest article, too. It looks as if even the deniers who like to pretend they are clever have now opted for dumb denial. I'm guessing they are trying to shift the Overton window back to where it will never be again. Humlum is correct. The trend in HadCRUT4 global monthly is negative from 2003 - present (slope ~ -0.01C / decade). Obviously this is too short a time-series to tell us anything about the forced long-term trend. It is dominated by noise (aka natural variability) and also highly sensitive to the choice of start year. That's not the latest version of HadCRUT4. That's the previous one and it stops in July. WoodforTrees is a good resource but unfortunately it doesn't show the latest versions of either HadCRUT4 or UAH. Using the monthly global data I get a trend of +0.008 (+0.01) C/dec from Jan 2003 to September 2014 (Excel). Humlum must be using this version, since the previous version stops in July and his chart clearly shows the last update as September. Therefore his downward trend line is bogus. "Seriously? You are de-bunking a skeptic claim of negative with 0.1 degC/century." The 'skeptic' claim I'm debunking isn't about 0.1 C/century, it's about falsely changing the direction of a trend line from very slightly positive to clearly negative. You may disagree, but to me that's a flat out attempt to mislead people by fabrication. You're quite right - WfT HadCRUT4 stops in July. I still can't get too worked up about denier chartsmanship of this type though. They do it all the time. The use of RSS *only* to make the 'no warming for 18 years' claim is, IMO, far more egregious. But then it was Monckton, so it would be. But why should we let people get away with propagating falsehoods? If we do that, we're part of the problem. Get him to change it then. I suspect John is referring to the Climate Change Discussion group on facebook. One of few truths at HW. Anonymous I think you should click on tonyhellerakastevengoddardisnotasociopath. The email was actually from a Dr Anonymous Coward! It's probably just me but I find the fact that Willis scrubbed out the name but left in the Dr prefix hilarious.